Diagnosis and Treatments of Gout – Evidence Based Medicine By Dr. Huynh Wynn Tran, MD and Dr. Kashyap Patel, MD. There’s No Reason To Let Joint Paint Slow You Down! Go-out Plex contains popular and effective natural extracts that have been traditionally used to reduce and prevent the outbreak of gout. 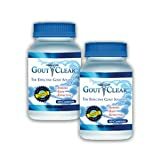 If you are looking for an all natural gout treatment, the combination of herbs and extracts in the Go-Out Plex formula have provided excellent gout symptom support for over ten years, with many satisfied customers. Many herbal experts consider the oils in celery seed extract to be one of the most highly effective herbs for gout treatment. Go-Out Plex uses a powerful celery seed extract standardized to 2.2% volatile oils. Participants in studies using celery seed extract had significant reduction in pain and increased mobility and quality of life scores. Go-Out Plex is Guaranteed to make a difference. If you do not feel that it made a difference then you may return it for a full refund. Please use the whole bottle as directed to give it an optimal chance to work. Don’t let pain keep you from doing the things you want to do – Grab some Go-Out Plex Now! This product does not contain genetically modified materials (non-GMO).